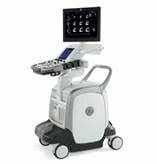 In need of a premium, top-of-the-line cardiovascular ultrasound machine system? Look no further than the GE Vivid E9 ultrasound machine. With technology optimized to easy acquisition, excellent quantification, and onboard archiving, this machine is truly the best in its field. Raw data image acquisition and archiving allow for the best onboard and post processing technology with high clinical values for quantification and review of stored images. With an ergonimcal design for improved productivity and optimized workflow capabilities, the GE Vivid E9 ultrasound machine has user comfort and ease in mind. Some of the top-of-the-line features of the Vivid E9 include 2D Clip crop for TTE used in 4D live imaging; automatic function imaging tools for wall motion scoring; an automatic assessment tool for surface tracking and LV quantification; and compatibility with EchoPac clinical workstation. In addition, GE Propietary XDClear Technology with an M5Sc Transducer with outstanding endocardial definition and FlexZoom technology for rotating and adjusting imaging efficiently give the Vivid E9 ultrasound machine a clear edge over its competitors. The Scan assist, customized guided protocol for consistent imaging and workflow adds enhanced capability to this already powerful machine. Similar systems to the Vivid E9 include the Acuson SC2000 Cardiovascular, the Philips iE33, and the HP Sonos 7500.